Satyajit Das paints an "abandon all hope all ye who enter here" portrait of the Japanese economic and budget situation, long term (Link). The upshot: getting all hotted up about Abenomics, whether for it or against it, is probably a waste of energy. Japan's current account surplus has also allowed the government to run large budget deficits which can be funded domestically. Since 2007, the Japanese trade account surplus has fallen sharply, turning into a deficit in 2012. The factors driving the fall include an appreciating Yen and slower global growth, which has reduced demand for Japanese products, such as cars and consumer electronics. In late 2012, territorial disputes with China exacerbated the decline in exports. It also reflects the impact of the Tohoku earthquake and tsunami as well as the subsequent decision to shut down Japanese nuclear power generators, which increased energy imports, especially Liquid Natural Gas. Unlike the demographic and incomes problems the country faces, items in the above passage are fixable -- or at least lend themselves to amelioration with government help and guidance. Work on energy supply -- which Abe Shinzo, in his recent policy address to the Diet, managed to ignore -- and you are attacking the trade deficit and economic restructuring at one swoop. Make gestures toward a cooling down of the acrimony in the Japan-China relationship -- which Abe is doing (Link) -- and one buys Japanese companies some breathing room to realign themselves to political changes in China. Damage the yen's status as a safe reserve currency -- and shutting up about doing so (in Diet questioning yesterday Abe again went into the red zone, promising to help those hurt by endaka) -- and one can help the profitability of Japanese companies (though just why Japan's exporters cannot handle currency strength and/or volatility escapes me). It is not as though nothing can be done. A good read, once one get past the unfortunate "tinderbox on water" metaphor ("A tinderbox? On water? What's the problem then?"). I will be delivering a speech on the outlook for the Abe Administration in 2013 -- or fizzle out trying to -- at Temple University Japan's Azabu Hall on 28 February 2013. Please R.S.V.P. if you should like to attend. The Economist's Free Exchange blog has been looking at attempts to inject the behavior of financial intermediaries into macroeconomic modeling. A recent post introduces a paper by Markus K. Brunnermeier and Yuliy Sannikov (Link) which takes a hard look at the tale the post-Bubble Japanese economy has to tell about treating the financial sector as a afterthought or as a fundamental element. I am trying to wrap my head around two items in the paper. 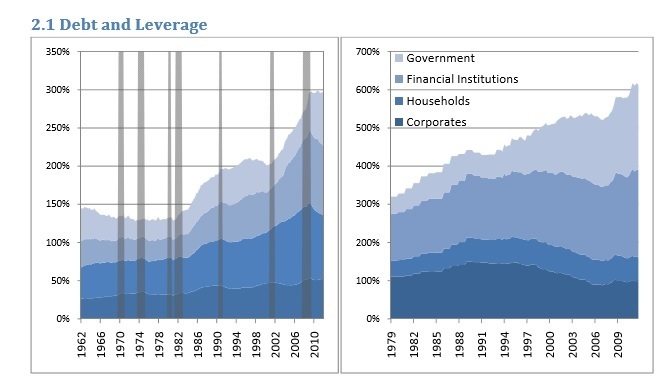 The first is the statement "Of course, aggregate total debt in a closed economy is zero." This is both obvious and salient for an economy such as Japan's where so much of all forms of debt are held domestically. The second is this pair of graphs of the aggregate debt levels in the economies of the United States (left) and Japan (right). What the right hand graph shows is that total debt in Japan is over 600% of GDP whereas in the United States the figure is less than 300%. The right hand graph also shows a massive shift in the creation of debt from the non-financial corporate sector (deepest blue) to the government (lightest blue) after 1991. What I am trying to understand is where is the ceiling -- the point where the various actors inside a largely closed economy say to each other, "We cannot go on borrowing like this from each other anymore"? Put another way, with Japan having zero incentive to foreclose upon itself, is there a percentage of GDP where the total aggregate liability becomes significant, save as a psychologically depressing factor? Later - Reader MK points me to the long, graph-rich look at Japan's economy published by John Makin of the American Enterprise Institute (Link). While Makin tries, as most Americans writing on Japan's economy do, to influence ongoing fiscal and monetary policy battles in Washington, the paper gives a comprehensive, if pessimistic view of the likelihood of Abenomics changing Japan's overall economic situation. One question: how is it that an economist who argues so strongly for the importance of large-scale, inevitably deficit-enlarging government spending, holds a chair at the American Enterprise Institute? What Does Abe Know That We Do Not Know? The most peculiar moment in the prime minister's policy speech yesterday? The one that starts at the 16:22 mark of the exceedingly brief (18:55 - with applause) address, the text of which I repost and translate below. When watching the video (Link) pay close attention to what happens after Abe finishes his last sentence. And then, more than anything, a resolution of the abductees problem. Until the day is upon us when all of the families of the abducted can hold their relations in their arms, my mission will not have ended. I will not swerve from the plan of employing "dialogue and pressure" upon the DPRK. I will exert every effort to meet the three goals of confirming the safety of and securing the immediate return of all of the abducted, clearing up the mystery surrounding the abductions and having those responsible for the abductions handed over to our custody. Notice the oddity? After Abe thunders out his determination, he is not greeted with a chorus of hooting or sustained applause. Just embarrassed-sounding shouts from a few members, quickly abandoned. The abductees issue is Abe's signature issue -- the pole he has used to vault over his more experienced and politically savvy rivals in the party. The stick, if you will, that props him up. One would have thought that the reactionary Friends of Shinzo, many of whom owe their seats and prominence to incessant thumping of rostrums about the abductees, would have prepared a coordinated explosion of applause and shouting at Abe's declaration of unwielding will. One would have thought that...and been wrong. I am not sure I understand the politics of including this paragraph in the speech, without support. The promises made are impossible to realize -- unless Abe knows something nobody else knows. 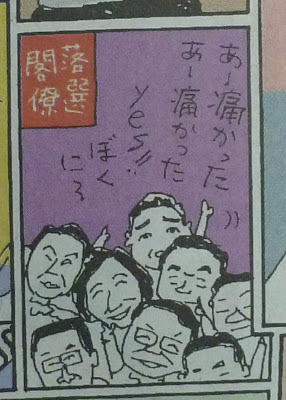 Neither those in the chamber nor the public needed a reminder that Abe is Abductee Man. So what was the point of making outlandish promises? To highlight the differences between his approach and the approaches of the last three Democratic Party of Japan prime ministers? When there cannot be any differences, either in approach or in outcomes? Wizards managing the Prime Minister's Residence's (Kantei) website had the text of the prime minister's policy speech (and now the video too) up immediately following the prime minister's address to the House of Representatives. 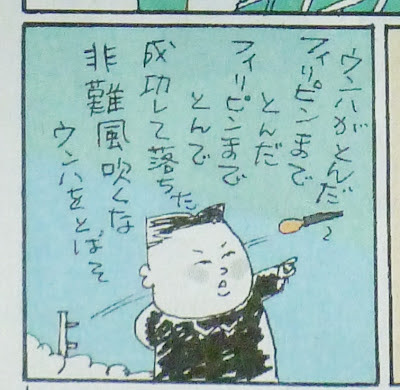 The English-language Kantei page, however, has nothing. Is it not standard operating procedure to provide the English translation along with the original text? Unsurprisingly, he opened with an executive summary of the Algerian gas plant incident and his government's response to the crisis. Surprisingly, he did not connect the events of the last two weeks with a call for an expansion of the capacity of the Self Defense Forces to carry out evacuations of Japanese nationals. Also surprising was how much of the the body of the exceedingly brief speech consisted of the pattings of the heads of the pet issues of a tiny minority, ignoring big policy issues of interest to the majority of the electorate. How else to explain the call to build a "respectable and proper society" (matto na shakai) -- the answer, it seems, to everything -- or the call for Japan to aim to be #1 -- a reference not, as some commentators are going to say, to Ezra Vogel, but to a question posed by Democratic Party of Japan legislator Ren Ho to bureaucrats defending Japan's next generation supercomputer program? It was also striking how much of the speech was delivered in an intellectual crouch. Was it really necessary to kick up the hysteria quotient, declaring the economy, reconstruction of the Tohoku, foreign affairs and education in crisis? Yes, if you are trying to seize power in an election. Yes, if you are trying to foist unpopular programs on a doubting electorate. But when you are front-loading the budgetary and monetary goodies and enjoying 65% Cabinet approval ratings -- do you need to do it then too? Sometimes one had to wonder whether the various parts in Abe's government are speaking to each other. Who is going to listen to Finance Minister Aso Taro's scoffing at the concept of the Japanese government having a beggar-thy-neighbor weak yen policy (Link) when the prime minister says in his Diet policy speech that unless Japanese policy changes, there will be no way to pull out of deflation and a high yen? What of China-Japan relations, other than a pledge to increase the national capacity to police Japan's territorial waters and airspace? What of Russo-Japanese relations? What of Japan-South Korea relations? What of energy policy? Or energy, period? (Just one mention, PLEASE!) What of pensions, eldercare, youth underemployment? And what are we supposed to make of a promise to return to primary budget balance in the medium term? Those who are interested in the issue know the promise to be a lie, while those are not interested in the issue cannot understand why the promise is being made. And why as a conclusion, after making all sorts of promises to better Japan and make the lives of its citizens easier (including an eyebrow-raising pledge to make it easier for domestic companies and organizations to recruit non-Japanese employees) wind up the speech with an "Do not ask others what will be done -- the only way to improve your own lives is by your own hands?" All in all, a surprisingly surprising little speech. Later, much later - Here is a translated Yomiuri Shimbun article (Link) providing the background to Abe's rhetorical question, "Everyone, shall we not go forward from this day with a goal of being the best in the world?" Most of my posts are about idiocy and venal failure. However, sometimes it is worthwhile to close the jaundiced eye and offer praise where it is deserved. The deaths of so many hostages in the firefight between Algerian military forces and insurgents in the third week of this month was a debacle of the first order. The Algerian government carried out a rescue operation on its own terms, with tragic consequences. The stoic yet caring conduct of JGC Corp.'s executives almost makes me forget Prime Minister Abe Shinzo's ludicrous reference to the dead workers as "corporate war dead" (kigyo senshi - Link - J)　and the news media's attempts to make an issue out of one of those killed's having been a dispatched worker from a personnel firm -- as if we all bought in to the concept that the killing of a full-time employee was somehow less sad. I have a sense that if a Democratic Party of Japan-led government had proposed debasing the currency, fiscal irresponsibility and standing up to China over the Senkaku Islands, the Hallelujah Chorus would have undermined the international image of Japan, calling the government "clumsy" and "amateurish" and its actions "politically motivated." So perhaps there is a silver lining in having Abe & Company in power after all. The East-West Center is now accepting applications from scholars and analysts who wish to undertake policy-relevant research and writing on issues of key relevance to the US-Japan partnership, including diplomatic, politico-security, economic, social and international fields. We especially welcome applicants specializing on Japan’s economy or US-Japan collaborative economic ties. Funded by the Center for Global Partnership (CGP) at the Japan Foundation, the fellowship finances a three-month OR six-month residence at the East-West Center in Washington, D.C. While in residence, the fellows will complete articles or a monograph to be considered for publication, such as the East-West Center’s Asia Pacific Bulletin series, Asia Pacific Issues series, or the Policy Studies series. The first full draft of longer publications should be completed before the end of the residency period. Fellows must also give a seminar on their topic. The fellowship includes a monthly stipend of US$2,500 to $4,500 (dependent upon experience) while in residence at EWC in Washington, round trip economy airfare to Washington, D.C., and a one-week research trip to Japan. Residency at the Center's Washington, D.C., office may begin as early as May 2013 and extend until January 2014. Deadline to submit materials is February 1. The Federal Reserve Bank of San Francisco's Regional and Foreign Institutions Group is seeking a team-oriented individual to serve as a country/banking analyst for the Country Analysis Unit (CAU). CAU is primarily dedicated to advancing the effective supervision of Asian Foreign Banking Organizations (FBOs) by: (1) evaluating the financial capacity of FBOs to support their U.S. operations; (2) identifying country risks and focusing supervisory resources to mitigate the impact of such risks; (3) strengthening relationships with Asian supervisory authorities and regional organizations; (4) enhancing our understanding of how Asian economic, financial sector and regulatory issues affect financial institutions; and (5) assisting the Federal Reserve System in developing and implementing effective supervisory strategies and policies. * An applicant for employment must be a U.S. Citizen, U.S. National, or hold a permanent resident/green card with intent to become a U.S. Citizen. • Familiarity with banking sector issues in Asia, in particular, Japan. The successful candidate will likely be responsible for covering Japan. • Financial sector experience in Asia or experience covering this region. • Proficiency in Japanese or another Asian language. The Head of Public Policy, Japan will be the primary contact with the Japanese government and policymakers and will work closely with the Privacy and Public Policy global team. This position is based in Tokyo. I suppose "Advise Prime Minister Abe Shinzo on how to optimize his 'Like' button" should also be on the responsibilities list of this last position. Pretty sobering is it not? Japan, on the way down (gently) since 1974. Sure, you can put in a lot of robots to make up for the decline in available workers -- but those robots are really lousy consumers. Pesek dives, as usual, way too deep in the smarmy snark and cynicism tanks. Nevertheless, he sees pretty much the same weaknesses I do. I guess this means I need to take a hard look at my current levels of coffee intake. Later - I should emphasize that I do not disagree with the fundamental policy -- that if one wishes to attempt a revival of economic growth, then one needs a combination of targeted fiscal stimulus, imprudent monetary policy and economic restructuring. I just cannot trust the Liberal Democratic Party and Abe Shinzo to make the tough decisions. Recall, the folks ostensibly running the country are the same crowd who, even when they possessed a supermajority in the House of Representatives, could not figure out how to renew a law 60 days prior to its expiration date. If Dr. Krugman, Matthew Yglesias and other Americans want the United States government to shrug off demands for fiscal probity, please do not point to the actions of an LDP-led government as a guide star. There is simply no way to idiot-proof a policy so that it is impervious to Abe and Company's ability to mess it up. A few weeks back University of Melbourne professor Richard Tanter wrote a Nautilus report on his attempt to shake the resolve of Koike Yuriko, the water carrier in Abe Shinzo's and the Liberal Democratic Party's efforts to promote women and women's issues. The hook is Koike's final brush off and the light her throwaway departing line shines upon fanaticism. It seems that a fanatic, when confronted with an incovenient truth, finds solace and stability in confusing cause with effect. First is I like Aso-san, a lot. He is by his own admission a simpleton, the worst student he ever met. While a holder of reactionary views, he is inconsistent, liking many things other reactionaries find corrupt and immoral. I admire and cherish his insouciance and his patriotism -- qualities so lacking in most of the fanatics whose company he keeps. Second, Aso has competition. While he has earned most of the attention this week for both his "hurry up and die" comment and for losing his shirt in negotiations with Bank of Japan governor Shirakawa Masaaki (Link), economic revitalization minister Amari Akira is probably still ahead on points. From his wandering off message as regards the strength of the yen (Link) to his incredibly bizarre four strategic targets for Government of Japan economic policy (Link) Amari seems intent on embarrassing himself and his boss. Jumping all over Aso for his well-intentioned gaffe will only numb audiences in advance of the waves of nonsense that will be issuing from the Friends of Shinzo over the coming days, weeks, months and years. Which brings up the third reason why I let Aso's comment slide: there is so much that is substantively wrong in what Abe and Company want to do to Japan that to pick apart a gaffe is to be complicit in a diversion of attention. That Aso said what he said does not reveal a heretofore dark hidden agenda or mindset anymore than Yanagisawa Hakuo's baby-making machines metaphor did (Link). What we learned is that Aso cannot express a thought to save his life -- which we already knew. Many thanks this morning to commenter "Troy." He has increased the value of my hastily-set down, half-formed opinions with links, supportive statements and counterarguments. Though I value all of his comments--and hope my readers do likewise--I would like to highlight two of his most recent contributions. The first is the link to the Ministry of Finance's English-language brief Japan's Fiscal Condition. While an update is due, the paper nevertheless provides an invaluable review, in just a few pages of graphs, of the background to the decisions being made regarding the country's finances. If you ever want, as I do, to rid yourself of the "It is my understanding that..." disease, going over this paper is a great first step. 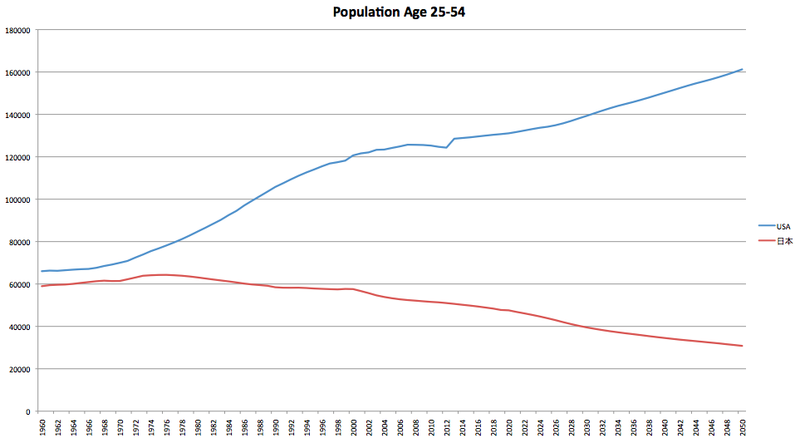 The second contribution is a graph of the size of Japan's 25-45 years-of-age cohort (Link). While I for selfish reasons despair at the narrowness of the window described, Troy's graph does show the fundamental macroeconomic problem: the swiftly falling numbers of persons in the top consumption years. Reductions in Japan's productive capacity can be made up with increased participation of women in the workforce, delayed retirement and increased productivity. However, the loss of domestic consumption is an issue the government and business either fail to grasp or want to face. One big victim of the shrinkage in the domestic market will have to be keiretsu tribalism. That Japan's markets are not free -- that purchases by either corporate consumers or individuals are guided as much by keiretsu loyalties as price or quality -- can be accepted and acceptable as long as the domestic market is growing or stable. The reality of a shrinking market -- that in order to keep sales on the same level, one must make inroads into a competitor's customer base -- is not something Japan's established businesses want to think about. However, do not make any investments based upon the above. No matter how inevitable the collapse of a large institutional structure, it will survive longer than reason dictates or suggests. Credit where credit is due: one could not pick a more photogenic and knowledgeable set of representatives of Japan's management and business development worlds (applied chemist Hashimoto, one of the two academics on the council, is a poster boy of academic-industrial cooperation). Which is the first problem. All of these folks have day jobs running successful companies or academic enterprises. Hasegawa, Amaterasu bless him, has two day jobs. Which means the amount of time and attention these persons can consecrate to the Industrial Competitiveness Council is minuscule. Unfortunately, the amount of energy and effort needed to come up with a feasible action plan for improving the competitiveness of Japanese business would be immense. If this were a real, functional council on competitiveness, membership in the council would not just be one's day job, it would be one's life. Which is the second problem. The Abe administration's economic revival plan is a trident with three prongs. The first is fiscal stimulus, either in a single burst or a steady program (Abe has unsurprisingly been silent about multi-year stimulus since the election). This debt-fueled kick start to the economy is geared to/needed to (there is a healthy debate as to the necessity) revive Japan's animal spirits. The second is an ultra-accommodative monetary policy, driving down the value of the yen and savings and supporting mild (2%) inflation. The third prong is supposed to be restructuring the economy. Since economic restructuring has an bad reputation, risutora being the euphemism for being laid off from work, the effort has been rebranded as economic revitalization, which sounds so much more hopeful. Strangely, while the Abe government has needed no advice on how to structure a fiscal stimulus package (Liberal Democratic Party-led governments having done so well in this department in the past) or how to work with the Bank of Japan on monetary policy ("Push outgoing Bank Governor Shirakawa Masaaki into a corner? Nailed it!") it seems, on the subject of changing the way Japanese government and business do business, to be in need of wise counsel, delivered at a measured pace. Could this need for advice, and not immediately, be because restructuring revitalization, requiring a strategy, meaning that one would have to pick winners and losers, meaning that one would have to dismantle or abandon inefficient market participants, which means demanding sacrifices from folks who tend to vote for the LDP, is...unpleasant? To put it another way -- if you wanted to have a credible revival economic plan, would you not want to have the bitter and the sweet together so as to make the whole more palatable, rather do than what the Abe government is doing, which is tossing out the honey pell-mell whilst retaining the bitter pill for a council of wisemen and wisewomen to ponder over? So let us say it together: the Industrial Competitiveness Council is a public relations stunt. Takenaka will stick around until such time as the Abe government makes its choice for the next Bank of Japan Governor. He will then leave, either to take up the governorship or to spend his free moments more wisely (Takenaka should open a training school on how to shrug off unprofitable activities without a shred of remorse). Other members of the council will continue to attend meetings but only to tell shaggy dog tales. Which is possibly the point of the whole exercise. I will admit it: I am a sucker for anyone who pays proper respect to Takahashi Korekiyo. Keysnesians of all nations should lay wreaths on the pedestal of the old man's statue (it is in the park next to the Canadian Embassy -- the former site of his home, the building having been moved to the Edo-Tokyo Open Air Architectural Museum) on the February 26 anniversary of his assassination. Former prime ministers have returned to the government as finance ministers three times in the modern era. Takahashi was the first to do so. His record of leading Japan out of the Great Depression places him in the pantheon of the greats of not Japanese but World History. The second was Miyazawa Kiichi, whose return to the cabinet as finance minister had a decidedly less spectacular effect on the country's economic well-being. Miyazawa will have to be remembered for having been in charge of the Economic Planning Agency during the miracle years*. Our present finance minister, Ambassador from Mangaland, bon vivant and empathy-challenged (Link) Aso Francisco Taro is the third former PM to take the helm of the nation's financial apparatus in a time of (in this case decidedly minor) economic crisis. What a degenerate era we live in. On Saturday the editors of The Japan Times -- a peculiar fraternity on the best of days -- published what can only be considered a transcendental editorial on rural depopulation. Transcendental, that is, in terms of its stupidity, none of the facts revealed being particularly surprising and none of the remedies suggested being reasonable. Nevertheless, the editorial (Link) is instructive in its replication of the fanciful domestic discussion on rural depopulation. Rather than accept the emptying of the countryside as a natural process, the editors find all kinds of external or structural weaknesses, including government action/inaction, to blame. Some of the cause-and-effect relations found are truly peculiar (The 2008 Lehman Shock closed factories in rural Japan?). The unspoken faith (The Great Lie told? - Ed.) is that if residents of rural areas face their problems squarely, solutions can be found to rural decline. Poppycock. What needs to be face squarely is that almost nothing can be done to reverse the emptying out of the countryside. For not even the Tokyo Metropolitan District can get rural life right. Whereas the population of the TMD is getting older, like everywhere else in Japan, the population of children is at least stable. The number of children in 0~14 years-of-age cohort did collapse from 2,155,242 in 1985 to only 1,427,229 in 2001. Ever since, however, the number of children has been growing, if only slightly, keeping the schools open and day care center builders employed. Despite the big rise in the population and stability in the numbers of children, the TMD is undergoing rural depopulation. The 1.6 million new TMD residents have not been absorbed primarily by the suburbs. Instead, population growth has occurred in the TMD's core. In 1996, the population of the inner 23 wards was 7,846,487. In December 2012 it was 9,007,407. In raw numbers, 75% of the growth in the TMD population has been accommodated in the already most densely populated third of the District (the purple area in this map). More people live in the 23 wards than at time in Edo/Tokyo's crowded history. Despite the significant population increase of the TMD as a whole, a well-funded and responsive local government and highly developed public transportation, highway and high-speed telecommunications networks that would ostensibly would allow anyone access to all the amenities of contemporary life, the population of the TMD's exurbs is shrinking. The extreme western, mountainous county (郡) part of the TMD has seen its population fall from 61,297 in 1996 to 58,232 at the end of last year -- a small decrease, to be sure, but still counter to the general population trend. Moreover, the least populated areas of the least populated region are losing population the fastest. Hinohara covers 5% of the TMD's total land area. It is, however, home to only 2,526 persons (1,262 men; 1,264 women) -- 0.02% of the TMD's total. While the average density in the TMD is 6,044 persons per square kilometer (Toshima Ward tops the list of municipalities at 22,161 persons per square kilometer) the number of Hinohara residents per square kilometer is fewer than 25. Yes, you read the above correctly: the population pyramid in the TMD's not unpretty (the touted Sengen Trail is a disappointment but the hike up Makiyoseyama is one of the Kanto's best day trips) hinterland is more skewed toward the gray than those of Japan's famously dying rural prefectures. And yes, the town lost 71 residents last year -- a 2.7% drop. Since 1985, the town's population has shrunk by more than a third. It is not as if Hinohara Village were the end of the world. By local bus and trains, Hinohara's town hall is little more than an hour and half out of Shinjuku. By private car the trip might take about the same amount of time. Yet despite being not just connected to the metropole but in the metropole, Hinohara, the community, is evaporating. Without immigration, its population will halve over the next 20 years. Stabilize the population of Akita? Stabilize Saga? Stabilize Hokkaido? Tell me how to stabilize Hinohara Village first. The comic verses (senryu) printed in the Tokyo Shimbun of January 19, 2013 reflect the current focus on the Abenomics, the prime minister's mix of inflation targeting and fiscal stimulus intent on jolting the economy out of its current recession. In December of each year, the monks of Kiyomizu Temple in Kyoto hold a special memorial event. A large blank piece of paper is propped up on an easel set on the temple's famous giant deck. 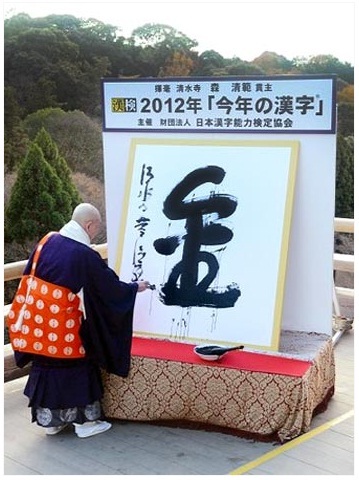 A monk, wielding an immense brush, writes upon the paper the Chinese character of the year. Here is a photo from last December's ceremony. The character for 2012 was kin - "gold" - a reference to the large number of medals won by Japanese athletes competing in the London Olympics. Kin, however, can also be read as kane - "money." The author of the verse is noting that even with the change of the years -- the specific kawaru used denotes a change where one takes up something new after ridding oneself of the old -- the subject of conversation remains the same. One of the questions regarding the inflation targeting aspects of Abenomics is what happens to consumption. The academic argument for inflation is that consumers, knowing that prices will rise, will make purchases now rather than later. There is certainly supporting evidence for this assertion in the way consumers reacted to the raising of the consumption tax level from 3% to 5% in 1997. However, the 1997 example has its negative side. While consumers did splurge up until the date of the raising of the consumption tax, sales fell through the floor immediately afterward. Given Japan's demographics reliance on bank deposits to supplement pensions (not to mention high level of public debt held by domestic financial institutions as liquid capital) there is a reasonable fear that inflation will be a wash, as older workers and retirees respond not by exchanging depreciating money for real goods but by restricting their spending even more than current low levels. In addition, the politically-motivated and directed fiscal stimulus package, funded through a sale of construction bonds, is seen as only adding to future tax burdens. 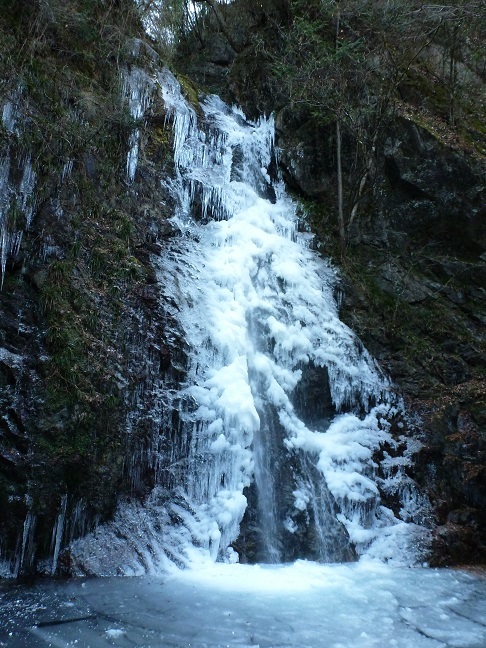 Japan has been enjoying, if that is the word one wishes to use, a long span of cold, snowy weather. The extreme cold has led to a huge increase in the prices of fresh vegetables, particularly leafy greens. 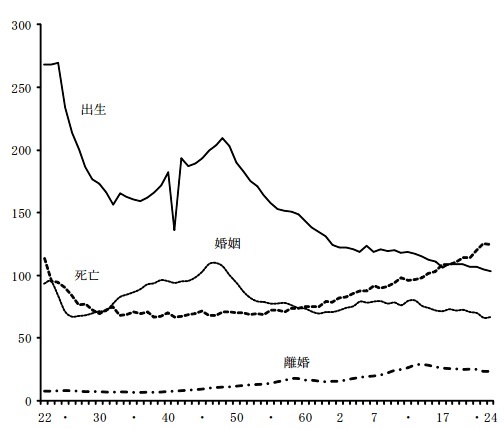 While some consumers have simple swallowed the rise in prices, most are responding by substitution (the other day on NHK, a vegetables specialist suggesting tiding oneself over through by increasing one's consumption of onions and kabu -- a distinctly medieval-sounding solution) or by going without. Which left one author to look askance at the Abe government's inflation targeting scheme. As regards fiscal outlays, the Tokyo Shimbun has been following Liberal Democratic Party maverick Kono Taro's investigation into just one tiny slice of the budget pie: the Finance Ministry's request in the Special Account for the Recovery of the Tohoku for 2.5 billion yen to fund the acquisition of "A Large-Scale CT Scanner For Sendai Airport, Et Cetera." Kono has taken a look into what is inside that "Et Cetera" (等 - nado). Unsurprisingly, he found that more than half of the items listed under the aferementioned heading have nothing to do with with replacing Sendai's airport tsunami-damaged large CT scanner. - 120 million for "Other - unspecified"
What needs to be said in these non-Japanese language reviews is what a goodly portion of the Japanese electorate already recognizes: that Abenomics is an attempt to buy victory in the House of Councillors election. Dump cash or promises of cash all over the country, talk the yen down so that exporters can book huge profits by the March 31 end of the fiscal year, push up share prices in the short term by creating expectations of monetary easing to the point of setting off asset inflation -- then hold an election. Win, win, win! The bill comes due after the polls close. Sadly, Abe Shinzo and his Liberal Democratic have to do nothing, zero, zip, rien, nicht, nanimo nai, nada to come out winners in July. The opposition Democratic Party of Japan is defending 30 district seats and 15 party proportional seats -- a hopeless task for the party, given its nearly comatose state and the emergence of rival opposition forces. Were the Abe Cabinet and the Liberal Democratic Party-New Komeito ruling alliance to just sit tight and do nothing but govern for the next six months, the LDP would seize half of the seats the DPJ and its splinters the Livelihood Party (Seikatsu no To) and Green Breeze (Midori no kaze) will be defending. So why destabilize the economy, if one has no good political reason to do so? If Abe has learned anything from 2007, and from his Cabinet and top Prime Minister's Residence appointments is seems he has learned little, it is get the sequencing right: win the House of Councillors election first, then embark on your reactionary revolution. Abe's term and the dreams of his camp followers became undone after 2007 loss of seats and control of the House to the DPJ. While nothing substantial had changed -- the LDP and the New Komeito alliance still possessed a 2/3rds supermajority in the House of Representatives -- Abe's legitimacy as president of the LDP had been compromised, allowing Aso Taro (What is in Amaterasu's name he doing in the present Cabinet?) and Yosano Kaoru to move in and take over de facto control of the government. Abe's goal this year is to win in the House of Councillors election -- whatever the costs to the nation -- in his view wiping out the memory of his 2007 failure. The magic number for the reactionaries is 160, which is 2/3rds of the seats in the House of Councillors. If the LDP and its allies, whoever they may be, can cobble together 160 seats, they are within shouting distance of amending the Constitution. At present the LDP and the New Komeito hold 92 seats. The Your Party and the Japan Restoration Party, parties sympathetic to the LDP's goal of amending the constitution, hold 11 and 3 seats respectively, bringing the total to 106. The math is daunting. The DPJ has 35 seats up for election, the Livelihood Party 6, Green Breeze 5. If the levels of losses of the December 16 election are replicated -- a not unreasonable outcome -- the LDP and its collaborators will scoop up around 75% of these seats -- i.e., 34 seats (Running total=140). Six are currently vacant -- five on-cycle and one off-cycle. Pick these up and the total is 146. Five independent seats are up for election. Take these or co-opt the seat owner to the constitutional amendment cause, and the total is 151. Snap up the one proportional seat from the doomed People's New Party and the total is 152. The only way to achieve any of these latter goals is for the LDP and its allies to be insanely popular going into the election and insanely popular coming out. With no reasonable path to 160, all that is left is the unreasonable. Strangely, I do not think that MacArthur would have had any problem in knowing what to say to a god. As for guessing games, Nishida Toshiyuki, who has been running himself ragged crusading for his native Fukushima, plays...I'm guessing, Yoshida Shigeru? Ibu Masato plays...the Showa Emperor? Nakamura Masatoshi (featured in the clip) plays...an impossibly wooden and black-haired Shirasu Jiro? Speaking of Tommy Lee Jones -- his BOSS commercials in the wake of 3/11, where Mr. Jones signs up for another stint on Earth, were uplifting at a hard time for this blessed land -- a damn difficult thing for a canned coffee commercial to be. Over at the Council for Foreign Relations website, Dr. Jeffrey Hornung of the Asia-Pacific Center for Security Studies Pacific Forum CSIS has posted a contribution to the "Is Japan in Decline?" debate series. Like most of Dr. Hornung's published opinion pieces, the essay presents a "the glass is half full" review of Japan's participation in international security activities, geared toward convincing American audiences* of Japan's possibly increasing security relevance. What should be clear is that, despite talk of Japan's decline, it is actively engaged in the security and diplomatic spheres in an effort to promote regional stability. Continuing this engagement will depend on Japan’s ability to overcome two domestic challenges: demographic implosion and mounting public debt. Both problems will have adverse effects on Japan's economy and the military, which will constrain defense spending and an ability to fund/expand security and diplomatic initiatives. Both require adept political leadership to rectify. If Japanese leaders can overcome these challenges, it would mean continuing opportunities to provide crucial resources to security partnerships and initiatives as well as leadership toward developing institutions and initiatives. If Japanese leaders fail, however, regional security will suffer as the gap left by the withdrawal of Japanese military capacity, expertise, and resources as well as diplomatic vision and commitment to multilateral institutions/initiatives will be difficult to replace. It is in this light that, if we envision a world without Japan, we can see it as being a consequential power. The above is flatulent nonsense. 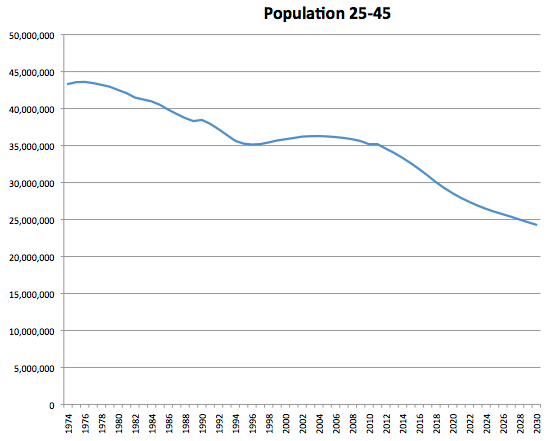 Under no conceivable (pun unintended) scenario can Japan's population decline be arrested. The cohort of women in their peak childbearing years is simply too small (see graph here). Contrary to Dr. Hornung's assertions, the limits on Japan's engagement in regional and global security cannot be the demographic shift ("implosion" is hyperbole) or public indebtedness. If they were, then the argument would already be over. China's and to a lesser extent North Korea's actions and the government's framing of new Japan Self Defense Forces security initiatives are the two most significant factors -- and will be for the foreseeable future. * Given the percentage of the world's elites educated in United States universities, writing for American elite audiences is globalization-on-the-cheap. Not a particularly profound observation, perhaps...but since when has that ever stopped me from climbing atop my virtual beer crate? - Clyde Prestowitz's MOSS ("More Of the Same Stuff" - Link) highlights one of the most infuriating aspects of Abe Shinzo's economic program. Abe & Co. have a supermajority in the House of Representatives, a four year mandate, a despised and divided opposition...and all they can come up with as plans for pulling Japan out of chronic deflation and low growth are a public works spending-heavy fiscal package and stripping the Bank of Japan of its independence. ARE YOU KIDDING ME? It seems than goosing the profits of exporters through currency manipulation, indirect as that manipulation may be, prior to the March 31 end of the fiscal year, upsets folks in other countries. - From domestic economists working for the research arms of financial giants, an assessment that the Abe fiscal stimulus package will create far fewer jobs than promised (Link). I am trying to figure out why these staff economists would have a vested interest in denigrating the stimulus. At present I cannot see an ulterior motive. * In the kind of precious slip of the tongue that only an old-fashioned pol in full smirk can deliver, Aso Taro, in his first NHK interview after being named Finance Minister, called the Finance Ministry the Okurasho ("Ministry of the Great Storehouse") -- the pompous archaism the MOF abandoned as its official name twelve years ago. Dr. Posen does not mention his more famous comrade-in-arms. Nevertheless he is offering Dr. Krugman a friendly hand that the Nobel laureate might pull himself up out of the swamp of Yglesianism (interim definition: "the act of writing about a largely imaginary Japan in an attempt to influence U.S. policy discussions"). Anyone think that a fine little bureaucratic quid-pro-quo -- worked out between the Ministry of Land and Resources and the People's Liberation Army against, let us say, the Ministry of Foreign Affairs -- could be a cause of this extraordinary difference of opinion among geologists? I do not want to be a naked East African Plains ape, waving his digits frantically, hooting in desperation that Abe Shinzo and his fellow travelers are a bunch of bad seeds kiting several hundred billion yen's worth of bad checks (Link) in order to buy July's House of Councillors election, at which point full-blown Abezania will be loosed upon this sadly scarred, dear little blue-green planet. Seriously, who wants to be just like everybody else? Inscription inside a shining sun reads, "Making our way toward the revival of Japan." "Toward a Beautiful Country" (Utsukushii kuni e) made not a jot of sense when Abe-san first foisted the idea upon us back in 2006-7 (Link) -- as what was on offer was not beautiful, save for those of an atavistic aesthetic. From the looks of it, Abe's conceptualization of Beauty is still a source of sardonic amusement. 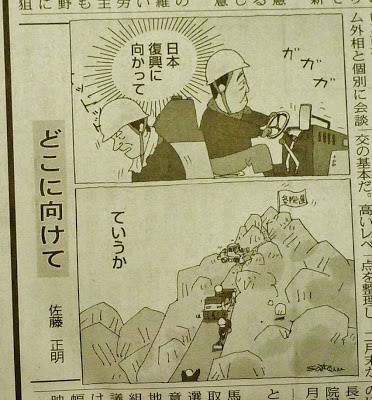 Image and senryu courtesy the Tokyo Shimbun, morning edition of 12 January 2013. I hesitate to agree with his conclusion. While I have to agree with the self-evident statement that inflation destroys debt, which would be good for the economy, it would also destroy the value of bonds, which would be bad. Dr. Smith refers to such value destruction as a "tax" on elderly bondholders -- which it is in terms of outcomes. However, high or hyper-inflation would be dishonest taxation, one not vetted by an electoral test. Inadvertently Dr. Smith's post highlights, rather than dismisses, the danger posed by the Abe government's enthusiasm for inflation. Dr. Smith claims that previous global incidences of hyperinflation have not been terribly damaging, at least from an economics standpoint (his use of Weimar Germany's hyperinflation as an example of a benign result tests my patience. As I remember, the collapse of faith in the Weimar government had a decidedly negative political outcome). As is often noted, almost all of Japan's debt is held by Japanese investors and institutions. What this means is that if inflation takes off, Japanese creditors get torched. This is completely different from the Latin American hyperinflations, where economic irresponsibility burned overseas bondholders as much as domestic ones (Argentina defaults and Italian pensioners are ruined, in the most recent example). High or hyper-inflation in this latter case is like lighting a stick of dynamite, throwing it, getting knocked down by the shockwave, then picking oneself up grinning, saying, "Whew, that was fun!" In the Japanese case, with Japanese on both sides of the creditor-debtor divide, inflation is like lighting a stick of dynamite, then holding on to it. Later - Dr. Smith replies in Comments. Pardon my saying it, but what a résumé! Watching newly appointed Council On Industrial Competitiveness member and Koizumi revolutionaire Takenaka Heizo get batted around by the panel on this morning's Asa Zuba! program, after a long segment on Shimane Prefecture (#1 in public works spending per capita of all of Japan's prefectures) construction company executives exulting at the Abe government's proposed economic stimulus package -- a report played absolutely straight so as to infuriate viewers in the Tokyo Metropolitan District, Kanagawa, Saitama, Chiba, Aichi, Kyoto and Osaka -- one had to wonder whether or not the fix was in from the beginning: that the news mediaverse treated the Liberal Democratic Party with kid gloves and piled scorn upon Democratic Party of Japan-governments because it missed having a party in power so transparently stupid and self-serving in its ways that the stories just write themselves. This December 27 Project Syndicate op-ed (Link) ostensibly (but obviously not) by the Prime Minister, sailed under my radar during the long Christmas-New Years gear down. In the summer of 2007, addressing the Central Hall of the Indian Parliament as Japan's prime minister, I spoke of the "Confluence of the Two Seas" – a phrase that I drew from the title of a book written by the Mughal prince Dara Shikoh in 1655 – to the applause and stomping approval of the assembled lawmakers. In the five years since then, I have become even more strongly convinced that what I said was correct. Yet, increasingly, the South China Sea seems set to become a "Lake Beijing," which analysts say will be to China what the Sea of Okhotsk was to Soviet Russia: a sea deep enough for the People’s Liberation Army’s navy to base their nuclear-powered attack submarines, capable of launching missiles with nuclear warheads. Soon, the PLA Navy's newly built aircraft carrier will be a common sight – more than sufficient to scare China’s neighbors. The ongoing disputes in the East China Sea and the South China Sea mean that Japan's top foreign-policy priority must be to expand the country's strategic horizons. Japan is a mature maritime democracy, and its choice of close partners should reflect that fact. I envisage a strategy whereby Australia, India, Japan, and the US state of Hawaii form a diamond to safeguard the maritime commons stretching from the Indian Ocean region to the western Pacific. I am prepared to invest, to the greatest possible extent, Japan’s capabilities in this security diamond. The reference to "my opponents in the Democratic Party of Japan" indicates that this little essay has been sitting on the shelf for a while, only seeing publication well after the time the surviving members of the DPJ had fallen below "opponent" status. As for the "security diamond" and "Lake Beijing" -- I am sure Liberal Democratic Party Vice President Komura Masahiko, the co-chair of the Japan-China Parliamentarians League and Abe Shinzo's conduit to the Chinese leadership, has been having a just dandy time explaining those two concepts away. A tip of the hat to James Holmes (Link) for highlighting this op-ed. This New York Times article (Link) on the out-of-all-control Fukushima cleanup is probably making the rounds. Still, I would be in remiss if I were to not to link to the piece. How can one resist the return of Hata Tsutomuesque nonsense? "Even if a method works overseas, the soil in Japan is different, for example," said Hidehiko Nishiyama, deputy director at the environment ministry, who is in charge of the Fukushima cleanup. 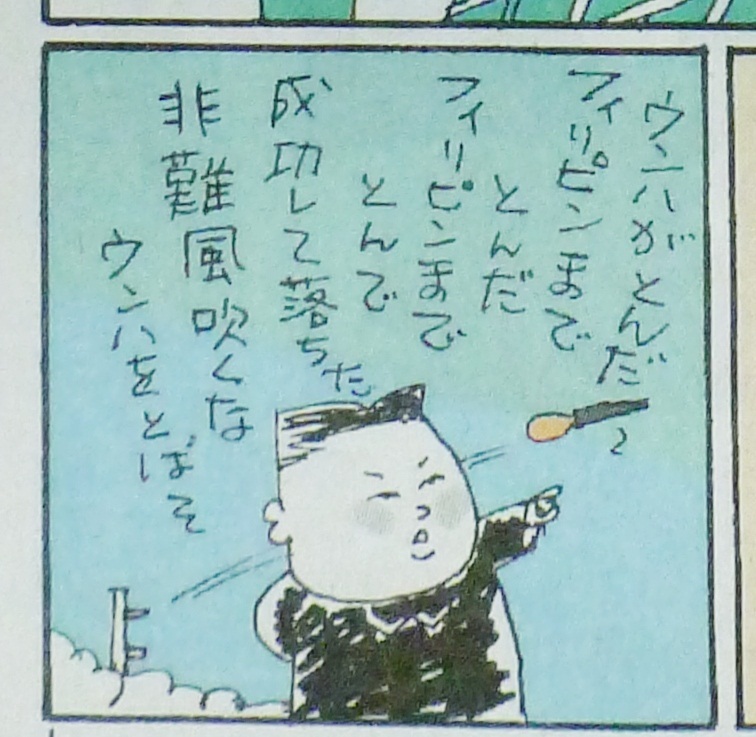 "And if we have foreigners roaming around Fukushima, they might scare the old grandmas and granddads there." Oh I am sure the journalists responsible for the above probably did not feel themselves the stewards of Nishiyama-san's reputation. But then again, evidently, neither did Nishiyama. Many thanks to reader JM for alerting me to the NYT article. To readers frustrated by my inadvertently and prematurely published post on Fukushima, my apologies. I hit the wrong button on my way out to breakfast. One of the claims made in the bid is that the games will be a celebration of and a contribution to the recovery of the Tohoku from the effects of the March 2011 earthquake, tsunami and nuclear meltdowns. Considering that the Tokyo Olympics 2.0 would be held eight years from now and almost entirely within a small area inside the TMD, the association with the recovery effort seems a stretch. The proposal has two or perhaps three of the preliminary soccer matches played in Sendai, but otherwise the link between the Olympics and the Tohoku disasters will be tenuous to the point of stimulating nervous laughter. I had a chance to hear Inose Naoki, now officially the governor of the TMD, offer some more concrete examples of how the TMD was contributing to the Tohoku recovery effort. 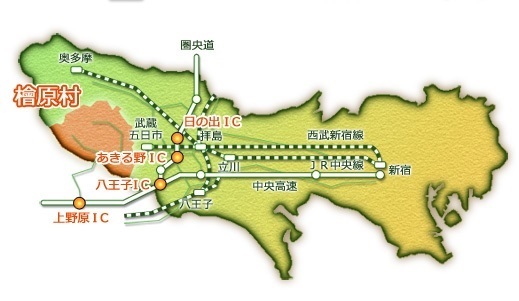 The TMD has dispatch hundreds of TMD bureaucrats on short stays to help administer the recovering areas (many prefectures are doing this, most prominently Aichi Prefecture) and is training and housing applicants for school teaching positions in the Tohoku. One of the programs Inose described sounded trivial but was in fact important. The TMD has issued coupons offering discounts on day trips or overnight stays in the Aizu-Wakamatsu area of Fukushima Prefecture. Whilst several towns the coast region of Fukushima are uninhabitable due to the Fukushima Dai'ichi nuclear power station disaster, and vast areas of coastal and central Fukushima are contaminated with nuclear fallout, the interior area around the city of Aizu-Wakamatsu is relatively contamination-free. However, as the region is inside Fukushima Prefecture, the largest of Japan's prefectures, it has seen its tourist visits fall through the floor. Since Aizu-Wakamatsu area was dependent on tourism, the false association with Fukushima Dai'ichi has sledgehammered the local economy. In the wake of the TMD's efforts to promote a return to the area (for a of slideshow from my one visit to Aizu-Wakamatsu, in 2009, click Here) the national broadcast network NHK has a new Taiga Dorama series, Yae no Sakura, set in Aizu-Wakamatsu. Like most Taiga dramas, the current series, airing every Sunday night for the rest of this year, is strongly tied to local, prefectural and NHK-led national efforts to promote tourism to the locales in which the story takes place. Learning the lesson brought home by last year's calamitous series on Taira no Kiyomori (one senryu of autumn last year had Prime Minister Noda Yoshihiko musing, "No matter how bad my popularity ratings are, they are still better than those for that Taiga Drama series on Taira no Kiyomori...") the main character, like the protagonists of the recent smash hits Atsuhime and Gon...Himetachi no Sengoku is a plucky young female historical figure. For some reason watching young women fight disdain, prejudice and adversity is more fun than watching middle-aged men sitting around shouting at one another. In the NHK depiction, the decidedly nonconformist Yae mutters the Aizu-Wakamatsu motto naranu koto wa naranu mono desu ("that which must not be shall not be") with contemptuous irony. Not so salutory was private broadcast network TBS' attempt at a costume drama contribution to Aizu-Wakamatsu tourism, Byakkotai. If Yamamoto Yae's story is one to remember, the story of the Byakkotai (White Tiger Company) is a story one wishes everyone would forget. 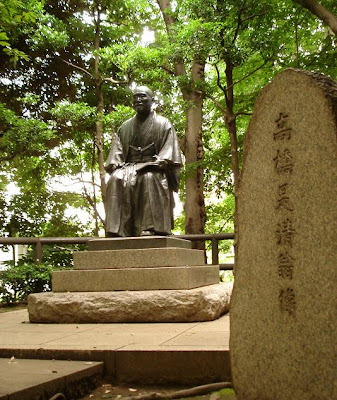 The teenagers of the White Tiger Company managed to make nothing of their brief lives, winning fame only for committing suicide upon the belief, mistaken as it turned, that Aizu-Wakamatsu's castle had fallen to the armies of the Meiji Emperor. For the love of Fukushima, give me the girl with the gun! It was painful watching Inoue Asahi, the very capable and likable news announcer on NHK's flagship Newswatch 9 evening news broadcast, quietly struggle last night with the new name of this blessed land, post-the December 16 election. Only a few weeks ago she was calling the country, "Nihon." Now, without explanation, she is calling it "Nippon," with the jut-jawed voiced consonant in the middle. It is 2007 all over again. Abe's commitment to his program has been admirable. He could have flown off the handle in response to the South Korean Supreme Court's decision, handed down just as his envoy to South Korea Nukaga Fukushiro was meeting President-elect Park Geun-hye (Link) to not extradite a Chinese national who set fire to Yasukuni Shrine (Link). The reasoning used by the Court, that the Japan-South Korea mutual extradition treaty falls into abeyance because the man had attacked a symbol of Japan's militarist/imperialist past, was worthy of a rant and a sharp reduction in government-to-government contacts. Abe let the storm pass, though, saying only that his government will vigorously protest the outcome. Let us be honest: having maundered and thundered during the campaign about Japan's need to stand up military to regional threats, Abe comes into office with very low expectations. We are, sadly enough, being asked to clap for his not starting an armed conflict with China or South Korea during his first two weeks in office. His reputation of militancy wins him a free pass on every concession he makes to the political needs of other governments or his every failure to react to provocations. In other words, when he acts like someone other than himself, he wins accolades. 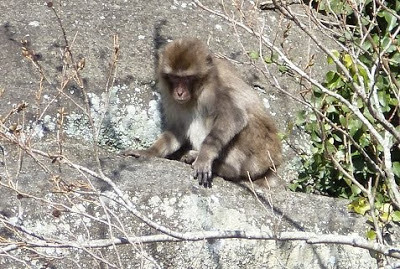 It also bears noticing that none of the envoys are card-carrying Friends of Shinzo. Abe probably does not trust his closest allies with important relationships. The FOS certainly have no credibility on the international stage. So instead of the usual pattern of dispatching of loyal retainers with close personal connections to sound out other governments, Abe is sending as his representatives senior politicians who have their own agendas. It will be up to the other governments to either listen to these envoys or lend them only half an ear out of recognition that they are not part of Abe's inner circle. An Abe administration pushback against other governments will likely remain on hold until after the House of Councillors election in July. The LDP-New Komeito alliance's defeat in the 2007 House of Councillors election spiked Abe's first premiership. If Abe learned anything from his first turn as prime minister, it is to win the House of Councillors election first, then unleash the hounds of his reactionary, revisionist revolution. Given that the onus will be on the Democratic Party of Japan to defend seats traditionally held by the LDP, the obvious strategy is to sit tight for the next seven months in anticipation of the DPJ's almost certain electoral implosion. Finally, one should avoid getting too hopped up about Abe's appointing smart and sober persons to advisory posts and advisory councils. Yes, he is surrounding himself with well-regarded academics and former bureaucrats. No, he does not have to listen to any of them. The theme, structure and pace of my post of last Friday, "The Aristocrats," seems to have been pipped by Kishore Mahbubani (Link). However Mahbubani, as is his wont, starts off in one direction and ends up somewhere he seemingly did not intend to go. The observation of a trend toward political dynasties in Asia is not new, having been made decades ago as regards the rise of female leaders in South Asian countries, starting with Sirimavo Bandaranaike of Sri Lanka. What is jolting is that the wave has swept east and north, with every country in this region now run by a descendant of a head of state or top leader. If were are all resigning ourselves to dynastic and aristocratic rule, can we have all the lives back that were wasted in the 19th and 20th century wrenching power from out of the hands of hereditary rulers? Just a quibble...but if one writes an article for non-specialists where one first quotes Jesper Koll and then Kathy Matsui of Goldman Sachs, should one mention that the pair are husband and wife? Meanwhile and a propos of nothing, Davos Man continues his sad use of an imaginary Japan as a springboard for talking to Americans about America. At 4:34 in the video, Koll shows a graph of the wages and bonuses a typical salaried worker receives over his or her lifetime. Wages remain low over the first 15 years of work, then rise rapidly, reach a peak at around 55 years of age, whereupon they decline until retirement. According to Koll, the passage of the "Mick Jagger" generation (Jagger was born in 1943) from its wage peak and into wage decline and retirement accounts for 80% of observed deflation. One has to assume he is talking about consumer prices deflation. He is clearly not talking about deflation in real estate -- that he accounts for differently. He does not even mention deflation in equities, an interesting choice given his day job. According to Koll, the massive deflationary pressure from declining wages and bonuses will reverse as the children of the Mick Jagger generation enter their high wage post-40 years of age period. Ummm, cannot say that I agree. On the first of this month, the Ministry of Health, Labour and Welfare released this graph. Let us look first at the top solid line. In 1949, births topped out at a never-to-be-seen again 2,678,792. They fell precipitously, bottoming out at 1,566,713 in 1957 -- a 42% drop in just 12 years' time. Births recovered as the Mick Jagger generation began having children, peaking at 2,091,983 in 1973 (note - half of this generation have already entered the stage when their earnings accelerate). This new peak of births is 32% smaller than the 1949 peak. After 1973, births fell slightly less precipitously than after 1949, hitting 1,431,577 in 1985 -- a 12 year fall of 32%. However, unlike in 1957, births have never recovered. Births have fallen slowly but steadily, declining 38% over the last 27 years, falling below the number of deaths (thick dotted line) in 2007.
a) the numerically largest generation ever is leaving the workforce. b) a numerically large generation is entering its high-wage period. However, their numbers are only around 75% of the generation whose total earning power they are supposed to be replacing. c) there are dramatically fewer children and young people to serve as consumers and workers. Good for them on an individual level as they will (in theory!) be able to bid up wages and demand lower prices for goods. Bad for the country in terms of aggregate spending. d) With births below replacement level, total population -- i.e., total consumption -- is going down and at an accelerating rate, the number of deaths over birth rising from 18,516 in 2007 to 210,000 last year. Koll is probably right about a boom coming on. However, it is for the folks selling investments and savings vehicles to the echo generation. That generation has to plan for lifespans of 90 years and for taking care of elderly parents for two decades before falling themselves into decrepitude -- all with little help from whatever survives of the national pension system. A surge in spending due to rising wages and bonuses? The birth and death numbers do not offer solace. And no no one in the Diet is losing much sleep over the implications of the above graph. To borrow a simile from Chris Rock, statistics and macro are like kryptonite to this blessed land's parliamentarians. Over the past few weeks I have heard from three persons who should know better statements on the order of "despite criticisms of Abe Shinzo's economic stimulus plans, the markets have been sending a strong signal of confidence in the new government." Really? A massive (and entirely legal) pump-and-dump operation and capital flight are signs of confidence in Abenomics? If the equities markets were rising due to the buzz around over the adoption of the a new technology, great. If the equities markets were rising on a resolution of the political problems between Japan and its neighbors, great. If the equities markets were rising on a strong signal from the nation's courts that they will protect the rights of shareholders, great. These are real, structural changes. The equities markets should rise in response. However, if the equities markets rise in anticipation of the arrival of a titanic wave of cash from the Bank of Japan, cash in desperate need of a place to part itself, then we should call the rise what it is: smart money bidding up the prices of parking places prior to arrival of a lot of dumb money. The current rise is not, of course, solely due to the monetary side of Abenomics. The proposed increase in public works is plumping up shares in the construction sector -- which is entirely cool, as long as folks in the Abe entourage did not buy into the sector prior to the announcement of the new spending priorities. Hoping that folks will not take advantage of inside information, however, is self-delusion. One can only hope that the scale of the skim was rather modest. It takes a blinding pathological obsession with the needs of exporters, however, to consider the fall in the price of the yen to be a vote of confidence in the Abe government. If there were confidence in the Japanese economy under Abe the yen would rise. Folks would be buying yen to get in on the fun. However, the smart money, seeing the Abe fiscal policies blowing out the budget and the politicization of the Bank of Japan discombobulating prices signals, is getting out while it can sell its yen holdings at a high price. When one considers that these sellers have an inherent interest in getting out as slowly and unobtrusively as possible so as to prevent a run on the yen, the scale and speed of the yen's drop of the last few weeks should be jaw-dropping. That sounds wrong on principle. It would not be if the supporters of the LDP were to take that money, invest it and create profit and/or societal benefits all could share. As we know, however, supporters of the LDP are net consumers of value: the projects they invest in are worth less upon completion than the amount invested. As for the financial profit made on arbitraging the debasing of the currency, I have little faith in it returning to the government in the form of higher tax revenues. If the smart puppies can make money foisting depreciating assets on the unsuspecting, I am fairly sure they can avoid the tax man as well. Bits and pieces of popular culture examining politics, left over from the end of the year. 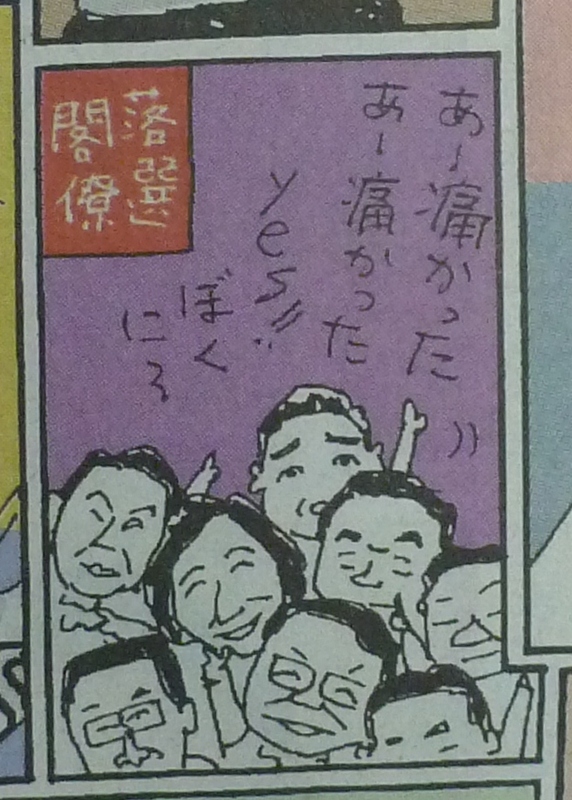 I have already posted one panel from Sato Masaaki's review of the year in politics as performances in the annual New Year's Eve Kohaku Uta Gassen ("Red-White Song Battle" - Link). To the collection I will add two more. For the myriad AKB48 fans out there, here is the bouncy but mournful song of the eight Noda Cabinet ministers who lost their Diet seats in the December 16 election debacle. The original is AKB48's iconic hit "Aitakatta" (Link-YouTube - yes, there seems to have been a time when Akimoto Yasushi had no money). However, instead of singing aitakatta ("I wanted to meet you") the defenestrated cabinet ministers sing a-itakatta ("Whoa! That hurt!"). It flew all the way to the Philippines. It was a success and fell to earth. Wind of criticism do not blow! Let us loft the Unh-ha!" "The soap bubble has flown. It flew all the way to the roof. it burst apart and disappeared. Wind! Wind! Do not blow! This one is already two weeks old...but the sentiment still holds, hopeless as it is. On with the New Year!